Punjabi Kurkuri Bhindi is a spicy fried snack or main course dish made using Okra, gram flour and spices. It is very irresistible and can be prepared in minutes. Here is how to make Kurkuri Bhindi, Bhindi Kurkuri or Crispy Okra (Step by Step + Video). 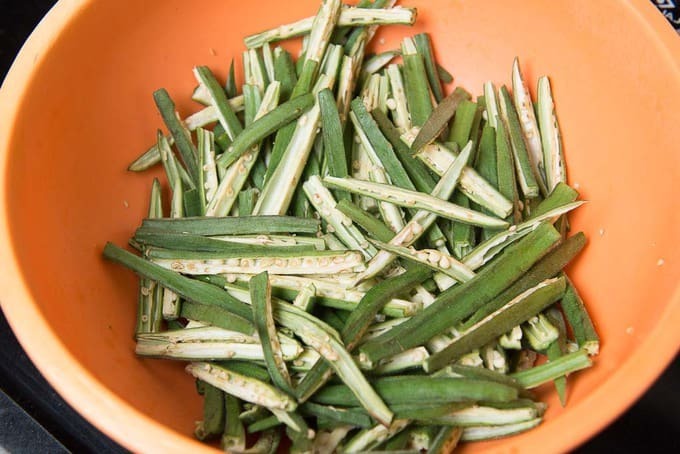 Lady’s finger or Okra is a great source of nutrients, it even aids in weight loss and controlling blood sugar levels. It also improves digestion as well. Hence, Bhindi is used often at my home for making lunch as well as snacks such as Kurkuri Bhindi. This bhindi kurkuri recipe can be eaten as an evening snack with tea, or enjoyed as main curse with white rice, Masoor Dal and papad. It is quick and easy to make and tastes best with a squeeze of lime before serving. Bharwan Bhindi and Moongphali Bhindi are the other semi-dry dishes that can be prepared with this versatile veggie. 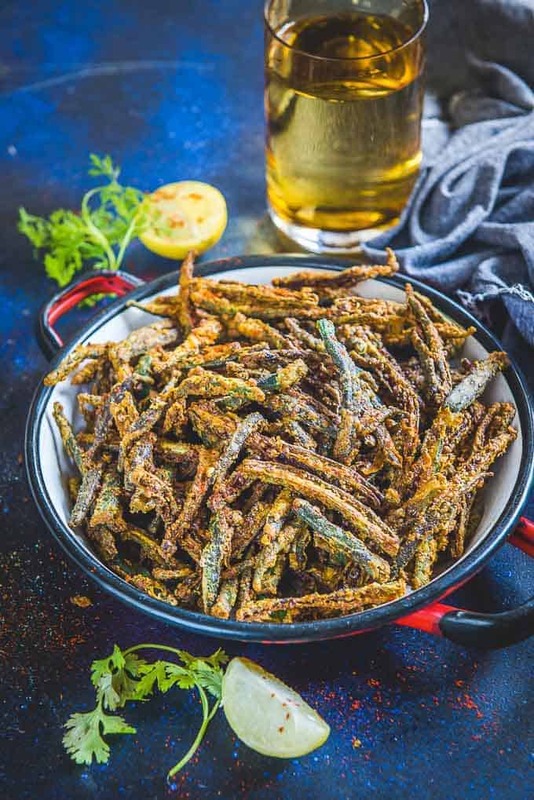 To make this recipe of Kurkuri Bhindi or Crispy Bhindi fry, thinly sliced lady finger is coated with spices like red chilli powder, chaat masala, cumin powder and garam masala powder. 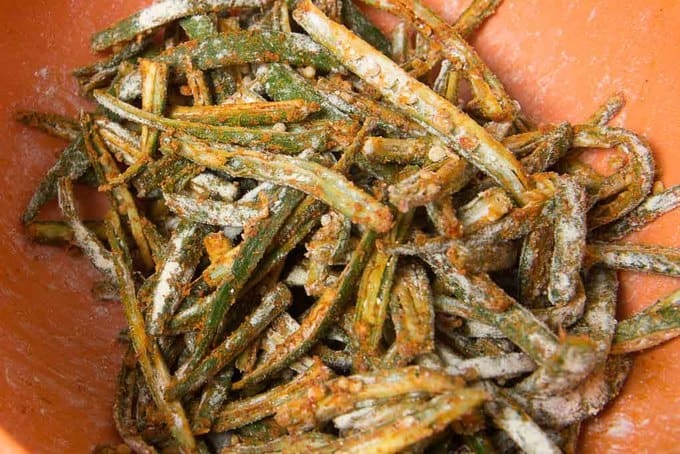 You must remove as many seeds as possible before you fry the okra. The bhindi is then coated with gram flour and corn flour. You can also add rice flour if you wish to, but I usually don’t add it and the result is fabulous. Some people also add coriander powder to the masala but I skip it too. Now heat oil in a pan and once the oil is hot, drop the masala coated bhindi in the pan and deep fry on high heat until golden brown. Take care to not over fry the bhindi as it will not taste good. You can also make Kurkuri bhindi without besan. Just replace it with rice flour and you are good to go. Keep switching between rice flour and besan for taste change. 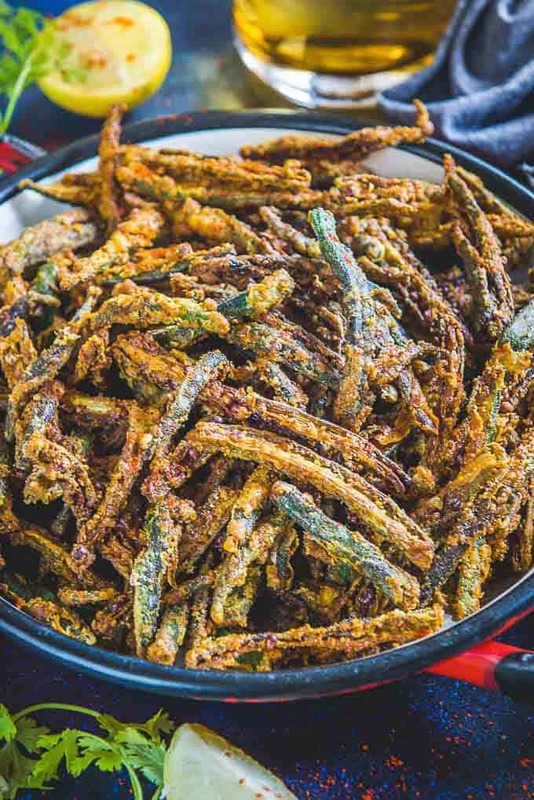 I even pack this crispy okra or bhindi in my kiddo’s and my husband’s tiffin box, so that they can munch on these crisp quickies whenever they get some free time. This bhindi is crunchy even after 15-20 minutes of frying, sometimes even more. So you don’t have to hurry up in eating it for the fear of it turning soggy soon. You can also adjust the spices according to your taste. Wipe the bhindi using a dish cloth before cutting them into stripes. Discard as many seeds as possible. Make sure to rest the bhindi after adding the spices for at least 10 minutes. Bhindi will release some water and this water can bind the besan which is added later. Fry the bhindi on high heat until crisp. 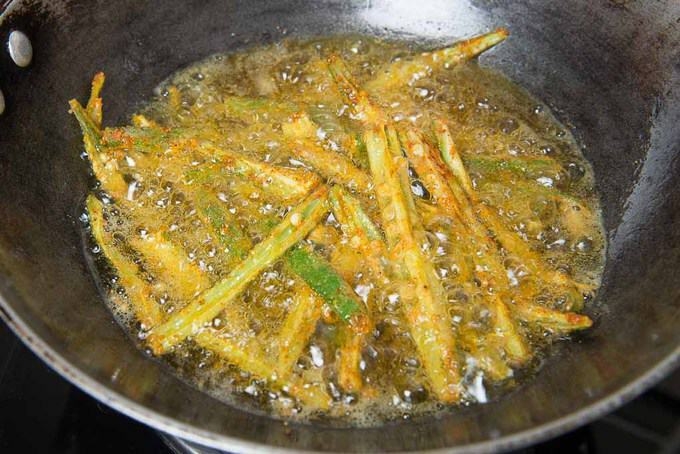 Frying on low heat will not result in crispy bhindi. If you are planning to serve the bhindi later, just fry it until it is slightly browned and then drain on a plate. Fry once more in very hot oil just before serving until golden brown. A reader suggested addition of ajwain in the batter and I think it’s a great idea. You can also try it. You can replace beasn with cornflour and rice flour if you wish to. If the bhindi is too dry and the masala is not sticking to it, just drizzle 2-3 drops of water in it. To make Kurkuri Bhindi in an oven, per heat the oven to 200 degrees C. Follow the steps until mixing the bhindi with besan and cornflour. Arrange the bhindi in a an over proof tray in a single layer. Spray with oil. Bake for 20 minutes. 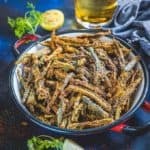 How to make Bhindi Kurkuri in Airfryer? To make Kurkuri Bhindi in an airfryer or Air Fryer Okra, pre heat the airfryer to 200 degrees C. Follow the steps until mixing the bhindi with besan and cornflour. Arrange the bhindi in the airfryer tray in a single layer. Spray with oil. Air fry for 10-12 minutes.Remove the tray from the airfryer and toss the bhindi. Air fry again for 5-6 minutes. 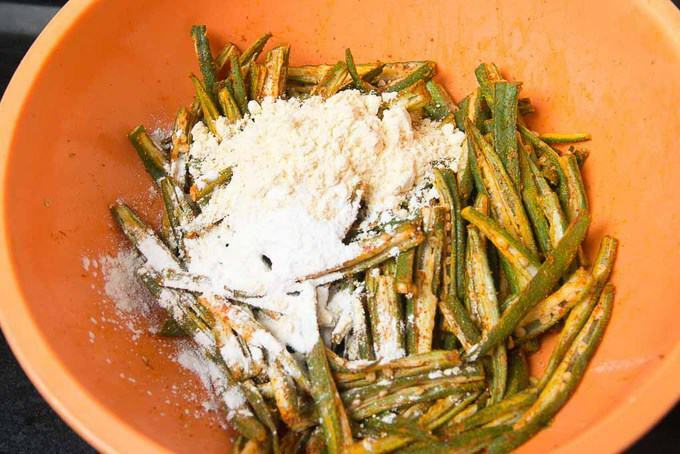 How to make Crispy Okra in Microwave? 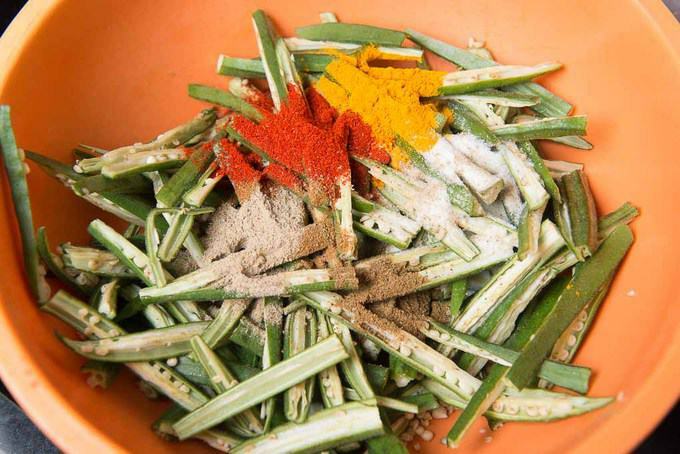 To make Kurkuri Bhindi in Microwave, follow the process until mixing the Bhindi with besan and cornflour. Then transfer the bhindi in a microwave safe dish. Spray with oil. Microwave on high for 8 minutes. Remove the dish from microwave and mix well. Micro again for 4 minutes. Wash and wipe bhindi. Cut it horizontally into 4 pieces. Add bhindi, salt, red chilli powder, turmeric powder, garam masala powder, cumin powder and chaat masala powder in a bowl. Let it rest for 10-12 minutes. Bhindi will leave water. Now add besan and cornflour to the bowl and mix lightly. Deep fry the bhindi in 3 batches over high heat till browned and crispy. Remove on a plate lined with kitchen towel to drain the excess oil. Sprinkle lemon juice on top. Serve immediately. Kurkuri Bhindi is a spicy fried snack or main course dish made using Okra, gram flour and spices. It is very irresistible and can be prepared in minutes. Cut it horizontally into 4 pieces. Discard as many seeds as possible. Add bhindi, salt, red chilli powder, turmeric powder, garam masala powder, cumin powder and chaat masala powder in a bowl. Let it rest for 10-12 minutes. Bhindi will leave little water. Deep fry the bhindi in 3 batches over high heat till browned and crispy. 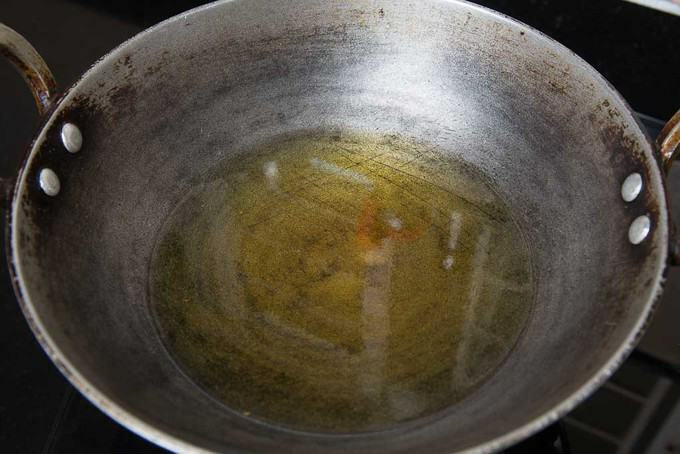 Remove on a plate lined with kitchen towel to drain the excess oil. Wipe the bhindi nicely and I suggest keep it open for an hour before adding spices to it. Try to remove as many seeds as you can before adding the spices. Be very careful while frying the bhindi. If you over fry it, it will turn bitter and if you under fry it, it will not be crispy. First time cooking okra. Your recipe was so delicious! They turned out crispy. My boys really liked it. Looks great! I love making this Bhindi, my mother passed it on to us. There are a few differences but essentially the same. The recipe is live on the blog and would love your feedback overall on our work. Great recipe, do you recommend adding ajwain? Ajwain will be a great addition.